OMEGA’s compact and affordable HH1304P is ideal for applications requiring display and printing of temperature measurements. Dual input features min/max, hi/lo audible alarms (with externally powered alarm driver signals) and differential measurements. 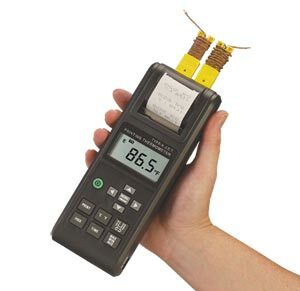 This 2-channel unit accepts Type J, K, T or E thermocouple inputs, has a high accuracy and 0.1° resolution. A built-in thermal printer makes hard copies of the temperature measurements, which can be taken at selected intervals. Parameters printed are time, date, temperature, and channel number. Battery powered or optional AC adaptor. Nota: Comes complete with 2 beaded wire Type K thermocouples (1 per input), alarm output cable, carry case, 6 "AAA" alkaline batteries, two rolls of thermal paper and operator's manual.